With all the hype around content marketing, all the attention is typically on the front-end, customer-facing content materials. That involves emails, eBooks, whitepapers, videos, and the myriad of other content deliverables that are focused on lead nurturing and demand generation. This is all well and good, but how about the “other” side of content marketing, the internal-facing content that marketers and especially product marketers have to create? Although not as glamorous, internal content like sales enablement materials are an important component of making sure all that nurturing given to your leads actually convert into deals. Materials such as industry playbooks, competitive battlecards, demo scripts, technical product FAQ’s and more are some of the elements found in any sales enablement program. But how do you know what content to create and how to prioritize? More importantly, how to make sure the sales team is aligned with marketing’s priorities for content creation? The best way I found to get the conversation started is to follow a simple framework that looks at the buyer’s journey, the sales person’s needs, and matches that up with different types of content that helps sales take the prospect through the sales cycle up to closing the deal. Then, I like to have right below it the buyer’s questions and goals at each stage. This helps solidify our understanding of the buyer’s needs at each stage. Right after that, I put in the sales rep goals. You see, buyers will have certain issues, goals, etc. as they walk through the buying journey and the sales rep will have his or her own goals to achieve. Understanding these different perspectives will help focus on types of content that not only help the buyer but assist the sales person as well. This also makes for interesting discussion when validating the framework with the sales leadership. 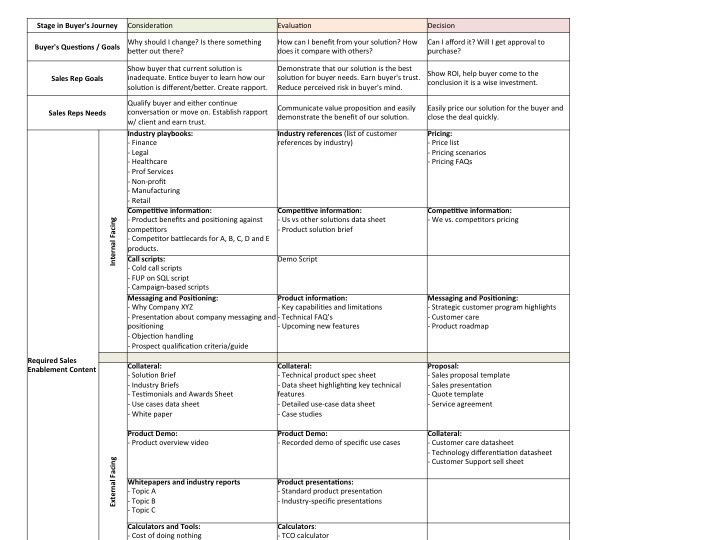 Finally, I then have the sales enablement materials aligned with each of the stages and in different categories, like “playbooks”, “messaging and positioning”, “competitive”, etc. I even separate the content into two separate areas, called “internal facing” and “external facing” content. This way we have a full picture of content needs throughout the buying cycle. Below is a snapshot of what this framework looks like in Excel. I found this is an effective way to brainstorm sales enablement content, get sales teams to give feedback, and help prioritize content creation and build a content calendar. I hope this helps in your own content creation and sales enablement efforts and welcome feedback and suggestions! You are currently browsing the The Effective Marketer blog archives for September, 2013.